Tempeh is one ingredient that I have only cooked twice in the span of almost ten years! I should use it more often as it packs a punch of benefits as a source of vegetarian protein, even better with higher protein and fiber than tofu. Similar to tofu, tempeh is a soy product; however the main difference lies in the fact that tempeh is cultured and fermented while tofu is not. The nutty taste, firm and chewy texture and nutritional benefits of tempeh is rather unique on its own. 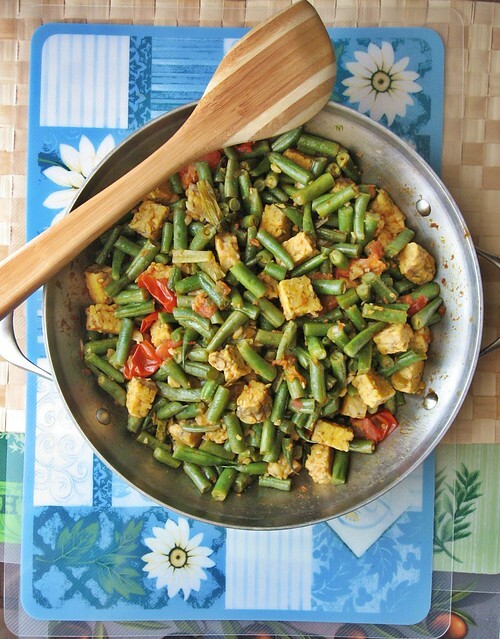 Tempeh with long beans/green beans also brings back my childhood memories as a must-order item at the Malay-rice stall in the school canteen. With feelings and memories of this childhood dish, I decided to give it a shot again, probably working on the sauce/gravy that pulls the tempeh and green beans together. 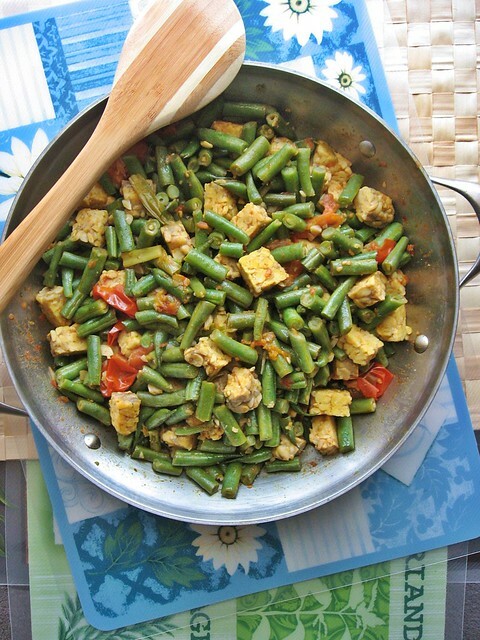 Directions: In a pan with oil, lightly cook the tempeh and green beans for about 3-5mins, set aside. Add a little more oil, saute the green onions, half the quantity of garlic, then tomatoes and cook till tomatoes release the juices. After that, add in the sauce and then return the tempeh and green beans and simmer with sauce till green beans are cooked, and sauce is reduced.